Monument Hill is a prominent sandstone bluff overlooking the Colorado River and the historic town of La Grange. It is an absolutely beautiful spot. The surrounding woodlands and prairies were a favorite hunting ground of prehistoric tribes. Later Spanish explorers traveled and traded along this route and named it El Camino de la Bahia or the Bay Trail. 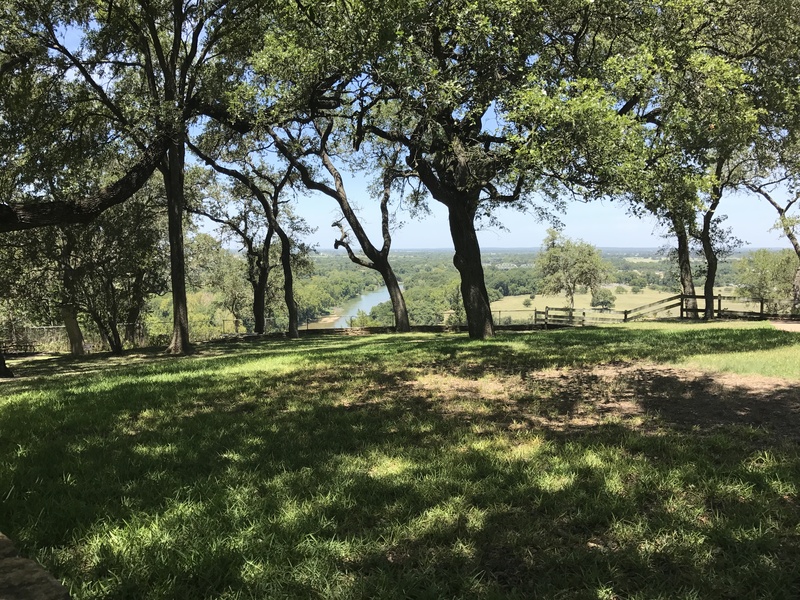 Monument Hill, however, is more than one of the most beautiful spots in Texas — it is hallowed ground. The hill derives its name from the towering monument that stands vigil over a granite crypt. That crypt is the final resting place for the remains of men who died in the struggle for Texas independence. In September of 1842, Mexican invaders had captured nearby San Antonio. When news of this invasion reached La Grange, Nicolas Dawson mobilized the local militia to go join the fight. Along the way, Dawson and his company of 54 men were attacked by the Mexican army, killing 36 of Dawson’s men. This incident became known as the Dawson Massacre. The deceased were later buried near Salado Creek. 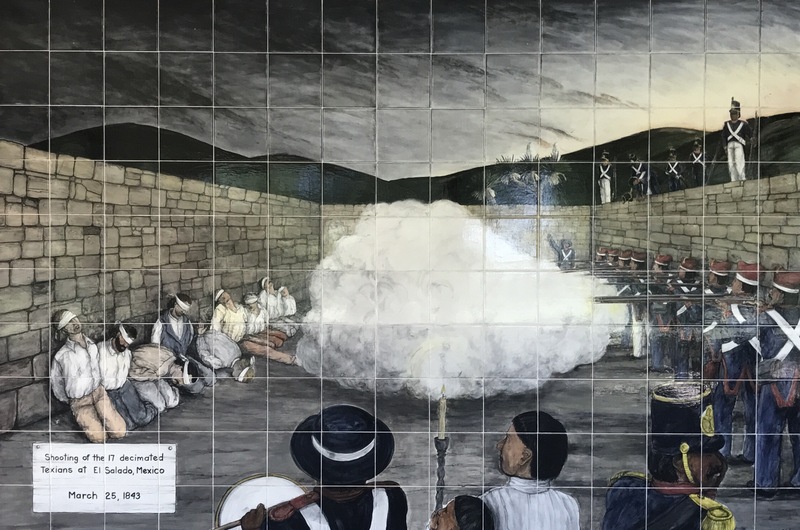 The survivors were taken prisoner and marched over 1,000 miles toward Perote Prison near Vera Cruz in southern Mexico. In the winter of 1842, over 300 Texan soldiers marched to the Mexican border town of Ciudad Mier to avenge the brutal Dawson Massacre. Once again, the Mexican army overpowered the Texans, took 250 prisoners, and marched those prisoners to Mexico City. Within six weeks of their captivity 181 men escaped. Harsh desert conditions, however, forced 176 of them to surrender. Mexican General Santa Anna was outraged by their defiance and ordered that one out of every ten men be executed. The men drew beans from a pot containing 159 white beans and 17 black beans. Those who drew the black beans were executed. This came to be known as the infamous Black Bean Lottery. In 1847, Texas Ranger and white bean survivor Lt. John Dusenberry returned to Mexico to exhume the remains of the Black Bean victims and return them to Texas. He chose La Grange as their resting place because it was the home of Captain William Eastland, the only officer executed in the Black Bean incident. Inspired by Dusenberry’s actions, citizens of Fayette County exhumed the bodies of Dawson’s massacred company from their graves near Salado Creek and brought them to La Grange. On September 14, 1848, the remains of Dawson’s men along with those of the Black Bean victims were reburied in a common tomb at Monument Hill. The present day granite vault was placed around the old tomb in 1933. The adjacent tower was erected by the Texas Centennial Commission and dedicated in 1936, the centennial of Texas independence. Monument Hill remains a beautiful resting place for the men who gave their lives in the struggle for Texas independence. 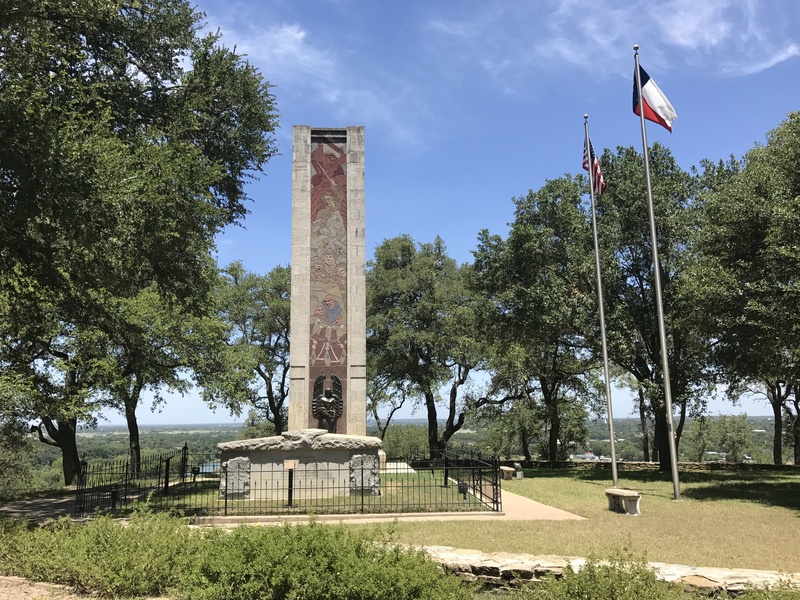 As you plan your Texas adventures and road trips, consider a visit to Monument Hill to pay homage to those brave men whose names are forever etched in the history of the Lone Star State. This entry was posted in Texas State Parks and tagged Black Bean Incident, Dawson Massacre, Monument Hill. Bookmark the permalink. Thanks for sharing this post – gonna add to my ever growing list of places to visit soon! Stay dry!! Beautiful and peaceful place. I was supposed to travel to Nepal today but alas the hurricane changed my plans. Flights cancelled.